Las Vegas – Oct. 15, 2014 – This year, the award-winning JW Marriott Las Vegas Resort and Rampart Casino commemorates its 15th anniversary of offering guests the finest service and top-tier luxury with its “15 Years of Fun” campaign. Voted as one of the “Top 5 Las Vegas Resorts” by readers of Condé Nast Traveler, recognized as a “Top-Performing Business” on TripAdvisor and a 10-time recipient of the AAA Four Diamond Award, the resort offers locals and visitors the absolute best in high-end amenities and hospitality. The “15 Years of Fun” initiative furthers customer satisfaction and ensures an unparalleled experience by bringing renovations, upgrades and added entertainment to the popular off-Strip destination. The anniversary excitement launched in September 2013 with updates to the Race & Sports Book. The popular sports betting location was enhanced with larger TVs, new carpet, a satellite betting station and Nevada Sports Books online sports betting app. In January, updates continued with the installation of new carpet inside the casino and Palms Tower corridors as well as the addition of hundreds of the industry’s latest slot machines such as Willy Wonka and the Chocolate Factory, Superman, Buffalo, Let’s Make A Deal, among others. Adding to the casino’s diverse entertainment lineup, Bonkerz Comedy Club in Edge Lounge debuted in February. Since opening, the venue has hosted numerous sold-out acts such as NBC’s “America’s Got Talent” finalist Grandma Lee. Bonkerz offers guests a full night of laughter, fully stocked bar and the nation’s best comedy each Thursday. Enhancing the hotel’s group and event options, the exquisite Valencia Ballroom completed renovations in February with updated wall coverings and carpeting. The 12,320-square-foot circular ballroom has an expansive terrace for up to 1,000 people, and provides a stunning option for events with a 30-foot vaulted ceiling, Mediterranean décor, floor-to-ceiling arched windows and scenic outdoor space with spectacular views of Red Rock Canyon and the Las Vegas Strip. The resort upgraded its luxurious poolside cabanas, which debuted in March. Enhancements include new furniture, flat-screen TVs, telephone, refrigerator, bottled water and a safe for valuables as well as classic amenities like food and beverage service from Waterside Café, guest towels, personal attendants and more. Great for parties, family gatherings and lounging, the cabanas boast a stunning view of the resort’s breathtaking pool, grounds and waterfalls. One of the most anticipated attractions on property, Rampart Casino’s Bingo Room opened its doors in April. Each day, it offers six one-hour sessions of bingo. The 300-seat gaming facility is complete with top-of-the-line technology by FortuNet, Inc. BingoStar®, complimentary drink service and a non-smoking section. The casino continued its enhancements in September by expanding its Summerlin Room Lounge to include a full buffet and an upgraded bar. The Summerlin Room is a secluded area for Summerlin and Summerlin Elite-level players only, featuring a fully-stocked bar, high-limit gaming, cocktail service and more. The property’s restaurants also received a refresh throughout the year. In May, the popular Tepanyaki destination Shizen added delectable flair to its menu including gluten and carbohydrate free noodle bowls and all-you-can-eat Sushi Sundays. Rampart Buffet and Promenade Café updated their décor in September, offering a more aesthetically pleasing dining experience . Additionally, the Promenade Café added more breakfast items and a new array of home-style entrées, such as chicken and waffles and macaroni and cheese. J.C. Wooloughan’s Irish Pub transformed into J.C. Irish Sports Pub. The pub has catered to its sports fanatics by adding new TVs, a special sports menu and a gaming section to the bar in October. Engineered for the utmost comfort and productivity, the resort’s Spa Tower updates began in June. The enhancements include a refreshed Spa Tower lobby; new bedding and headboards; improved artwork, paint and wallpaper; updated luxury restrooms complete with rainfall showers and Jacuzzis; and new carpet. The Palms Tower hotel rooms are slated to complete renovations in 2015. In addition to renovations and enhanced entertainment options this year, Rampart Casino has added exciting gaming promotions for its players including the previous $100,000 Cars ‘n’ Cash Giveaway in April where they gave away a Toyota and $75,000 Cruisin’ for a Cadillac & Cash Giveaway in September where one lucky winner went home with a brand new Cadillac. This month, it officially launches its “15 Years of Fun” campaign with the $100,000 15th Anniversary Giveaway in addition to its $20,000 Red Zone to Riches Pro Football Challenge, hot seat drawings, free slot tournaments, weekly blackjack tournaments, and more. 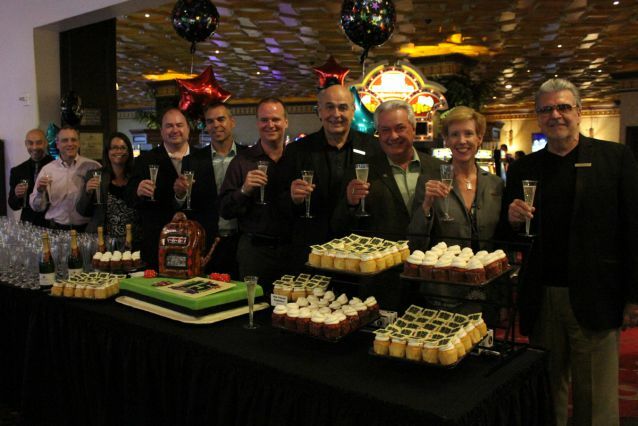 To commemorate the 15-year anniversary milestone and “15 Years of Fun” promotion, JW Marriott Las Vegas Resort and Rampart Casino General Manager Mike Gaughan, Jr. hosted a champagne toast and cake-cutting ceremony in the casino for fans on Friday, Oct. 10. For more information and updates on JW Marriott Las Vegas Resort and its renovations, please visitwww.jwlasvegasrefreshed.com or www.marriott.com/LASJW. For more information on Rampart Casino and its upcoming promotions and events, visit www.rampartcasino.com. 2014 marks the luxurious Rampart Casino’s 15-year anniversary, in conjunction with JW Marriott Las Vegas Resort & Spa. The casino celebrates “15 Years of Fun” by adding hundreds of the industry’s latest slots, a new state-of-the-art Bingo Room and more. The elegant 50,000 square foot casino, offers over 1,200 slot machines, two dozen gaming tables and a Race & Sports Book. Rampart Casino’s Resort Rewards club program offers exclusive resort benefits and rewards based on play, such as dining, spa and golf discounts, plus complimentary room nights at the JW Marriott Las Vegas Resort & Spa. For the latest Rampart Casino news, follow on Facebook (RampartCasino) and Twitter (@RampartCasino). Contact the casino at 702-507-5900. The JW Marriott Las Vegas Resort & Spa offers world-class luxury just 20 minutes northwest of the famous Las Vegas Strip. The award-winning resort celebrates 15 years of success in 2014, along with Rampart Casino, with its “15 Years of Fun” campaign, and it is sure to be the property’s best year yet with exciting renovations, additions and more. The Las Vegas resort is accessible to Las Vegas Speedway, TPC Las Vegas and a number of other golf courses. The JW Marriott features 548 well-appointed guest rooms and suites set amid 54 acres of lush gardens. Voted as one of the Top 5 Las Vegas Resorts by readers of Condé Nast Traveler, and recognized as a Top-Performing Business on TripAdvisor ranked in the top 10 percent worldwide for traveler feedback, the Las Vegas resort also includes a full-service spa, state-of-the-art fitness center, 33 meetings rooms with 100,000 square feet of flexible space, more than 10 restaurants serving American, Italian, Japanese and Mediterranean cuisines and the on-site Rampart Casino. For information, visit www.marriott.com/LASJW. Stay up to date with the JW Marriott Las Vegas Resort & Spa on Facebook and Twitter. Marriott and the JW Marriott system are not associated with any part of The Resort at Summerlin (the “Resort”) other than the JW Marriott Las Vegas hotel (the “Hotel”) at the Resort. The Casino is not part of the Hotel and is not part of the JW Marriott system.